For various and sundry reasons, I haven’t been knitting or designing much lately, but thanks to gentle prompts by my accountability partner I’ve only mostly been neglecting knitting rather than completely neglecting it. Part of that neglect has been ignoring all the recent calls for submissions, but on Valentine’s Day, I looked at two calls that Knit Picks put out a few weeks ago. One was for items that take less than 200 grams of yarn, the other for garter stitch items. Since the deadline was the next day and I wasn’t sure I could come up with one idea, never mind two, and since I’m always all about doing the easiest thing and with garter stitch you knit every row, I started knitting every row. Garter stitch isn’t the most exciting stitch on the books, and it always manages to scream “new knitter,” but it seems like the knitting world is in love with it all of a sudden. I found a lot of that to be oxymoronic as it applies to garter stitch, but I gave it a shot. I tried this and that, which is hard to do when you can’t even purl, and nothing was happening for a couple of hours. But then I added a second color and a little bit of magic, and blimey, I had something that looked like checks on one side and stripes on the other. And it had clever, engaging construction and pops of color, and was knit entirely in garter. And it hardly even looked like garter stitch (read: not ugly). The next day, Monday, deadline day, I knit up a swatch using colors from the call, wrote up the proposal, and sent ‘er in. Knit Picks doesn’t drag their feet when it comes to decisions so I’ll get a yay or nay on Friday. Send up some prayers for me, yeah? Green Mountain Spinnery is a small, sustainable family-owned yarn company located in one of the states my alter (richer) ego has dreamed of living—Vermont. They put out a call for submissions for sweater designs using their Mountain Mohair yarn. It’s a mostly wool blend yarn with 30% mohair “sourced from Angora Goats from various herds across the country from Vermont to Texas.” And it has cool color names like Alpenglo, Blue Gentian, Edelweiss, and Vincent’s Gold. Being that my Icelandic sweater design would be perfect for this yarn, and being that it was available for submission, I sent it in—a full 11 days ahead of the deadline. Wrong side out to preserve secrecy. While the stranded yoke would look good in just about any three of Green Mountain Spinnery’s colors, I proposed ones similar to the swatch because a) that color combo works, and b) you never know about another person’s ability to envision. Beautiful subtleties in each color. They notify in three weeks from the submission deadline, so please send up prayers for good news on June 12th. Last month was the deadline for Knitscene’s Spring 2016 issue. Checks and Balances – Gingham, checks, and plaids. Imagine ways to work with the season’s most popular fabric in texture and color for simple but fun garments and accessories. Retro Fashion – Sweet details make the difference in retro-inspired knitwear. We’re seeking garments and accessories that could have come from the 1940s or 1950s—or have been inspired by those classic looks. I ignored the first one because plaids usually involves the intarsia knitting technique, which makes my eyeballs itch. The second one for retro-inspired knitwear, however, could be done. I threw myself into the briar patch of Pinterest, researching looks for both decades, and found a 50s dress design by Anne Fogarty that could be translated into a sweater. Knitscene hasn’t followed in their sister magazine‘s footsteps and switched to online proposals, so I mailed a swatch for the sweater and also sent them a hat with a design that could be from any era. Magazines and yarn companies are thinking about next spring, which means that I am thinking about next spring. Small, cute, fun and quick to knit, these projects are purposefully made with stashbusting in mind! Colorwork, pom-poms, stripes, and colorblocking are perfect ways to use up those last few bits of yarn to make something warm and cozy. Clever and whimsical details make these projects must knit. The collection will be divided by weight into sections featuring 50g, 100g, and 150g of yarn. I had the perfect thing for them. When designing the Icelandic sweater I submitted to Interweave Knits a couple of weeks ago, I had taken a day trip into Norwegian territory. I used a hat to test the design, and it looked pretty good, so I knit a couple more hats to tweak the particulars. I submitted that hat a week early, and since I was flush with extra time, I worked on another hat design, this one using a cable that didn’t make the final cut for The Sweater. I spent quite a few hours perfecting, what else?—the crown decreases. And I have three more hats to sell at the farmer’s market next fall. And please don’t worry that my position as a procrastination super star is in jeopardy. I submitted the hat very late the night of the deadline. Knit Picks sends out yays and nays by this Friday, so won’t you please send up prayers that they both earn a yay? Yesterday was the deadline for Interweave Knits Winter 2016 issue. For the Winter issue, we want to see traditional, iconic sweaters. That is the theme. Give us your best Arans, Fair Isle pullovers, ganseys, Nordic ski sweaters, Icelandic yokes, Bohus yokes, and more. I’ve been hankering for a big colorwork design, so I started a new one from scratch. I had the idea for an Icelandic pullover, but it turned into a Norwegian sort of design, which I then rolled back over to Icelandic. I was specifically designing the lopapeysa style of Icelandic sweater, which has long jaggedy graphics in the yoke. The Norwegian graphics are smaller and tighter, and tend toward snowflake-type motifs. My design uses three colors, sometimes in the same row, which, I tell you, was quite the challenge until I got the hang of it. It wasn’t the knitting so much as the stranding, and just to make sure I could do it, I knit a full-size yoke. Wrong side showing some decent stranding, if I do say so. Interweave Knits has changed their submission process, having you email a proposal with photos rather than the actual swatch, which has sent this procrastinator over the moon. So, I submitted my Icelandic sweater. I’m not sure I want IK to accept both sweaters* as I would have to finish designing and then knit two major projects on deadline. *Just kidding. Of course I want to have two designs in the same issue of Interweave Knits. Please send up good thoughts and prayers. Knit Now is a knit and crochet magazine out of the UK. The magazine cover has a sort of Woman’s World vibe, but the patterns are cute. These covers sell a lot of magazines. Unlike most knitting magazines that publish quarterly with a special issue here and there, Knit Now publishes monthly, so their call for submissions is for three months’ worth. And also unlike most knitting magazines, they regularly publish patterns for babies and homewares along with women’s garments and accessories. They put out an interesting call for their Summer 2015 issues, and by interesting, I mean that I already had a couple of things that would fit the call and I didn’t have to do any real work. City Chic – Relaxed garments and simple accessories are the order of the day. Concentrate on stylish pieces which would be just as home in the office as on the street. So, I spent Game Day submitting my Welligkeit Vest (a.k.a. Adelante Tank and Petal Tank), that was previously rejected by Knitscene, Twist Collective, and knit.wear. Just a photo that shows nothing. I also submitted my Brookshire Pillow that Knitscene didn’t want. A picture that shows a little more than nothing. Because this is a British publication, I was extra careful to include both inches and centimeters for all measurements. Their deadline is February 18th before 6:00 GMT, and since I’m too lazy to figure out exactly when that is, I submitted my proposals 17 days early. They notify within a week of the deadline, so please send out good thoughts and prayers that at least one of my patterns will be published across the pond. **What’s with the whimsy all of a sudden? Knit Picks was on about that too. ***Uninvited guests could mean anything from scorpions and centipedes to most of my family, so I just stayed away from that. Yesterday—a full day before the deadline*, thank you—I submitted a proposal to Holla Knits for their Warm Weather Accessories collection. As always, I’m looking for risky, unique knits you won’t see in print knitting pattern magazines. Make a bold color choice. Chose a challenging stitch pattern. Use those advanced knitting skills and produce a show stopping knit you want to wear or use every time you leave the house. 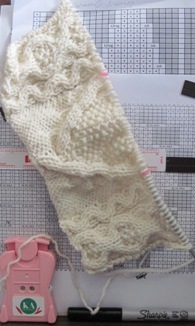 I submitted that kerchief thing that Interweave Knits rejected a few months ago. As far as I could determine, nothing like this exists in the knitting world, so it might just be unique enough (and challenging with all those bobbles) to be one of the six items they’re going to publish in this collection. Send up prayers and good thoughts for me, would you? *The editor prefers a physical swatch via snailmail, but will accept an emailed proposal with photos, which is good because I kept snoozing the online calendar notification until it was too late to mail it. No, The Sweater isn’t finished, but it’s close enough to make me confident that I can finish it for Knitscene if they want it. That first nip of cold weather is a signal to knitters everywhere to break out the woolens and warm layers. We’re seeking submissions for our Winter Essentials collection—perfect items to knit for women and men that play on the traditional winter wardrobe staples. Use texture, color, and clever twists on basic silhouettes in must-knit garment and accessory designs. There’s no specific colorwork or cable or style icon story, so it seems like anything goes. Knitscene is part of Interweave Press, so they want you to send an actual knitted swatch via snail mail. I thought I was going to submit something else, but that didn’t come together in time, which means that by the time I decided to submit The Sweater, it was almost the last minute. A new take on a traditional staple. But Knitscene can’t accept what I don’t send, so I packaged it up and mailed it off. *I told you it was a silly reason.